Here are the wonderful family. The Halloween disguise is a perfect match for their looks. They are really cool and I like their cheerful atmosphere. "Eddie Valiant", "Jessica Rabbit", and "Baby Herman" from "Who Framed Roger Rabbit". Lovely, sprightly, cheerful cars flock to TDL. A characteristic created by various accessories like bags, headdress, and so on. "Mater", "Sally Hudson", "Lightning McQueen", "Luigi", "Fillmore" from "Cars". I received a happy email from Helene-san in France. 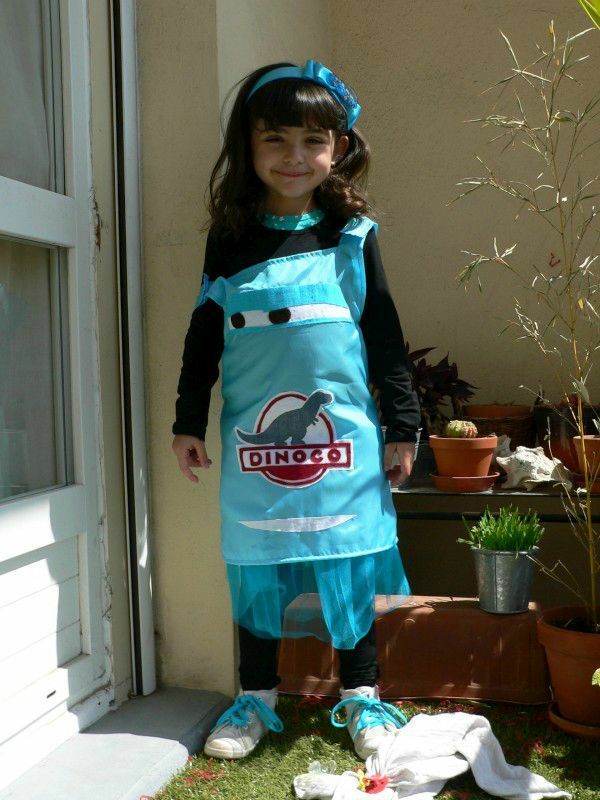 She said that she was very inspired by the upper picture, the girl's costumes "cars" of my site to make one for her niece. Looks great! Thank you for sharing this wonderful picture. More beautiful pics, please visit to Helene-san's website. What a cute Mrs. Potato Head! She makes a success of incorporation Mrs. Potato Head the toy into her Halloween style. "Mrs. Potato Head" from "Toy Story 2", "Toy Story 3". Welcome to the Halloween Town! It is a very happy moment to find a family Halloween disguise. The two black button on the hat exactly looks like a face of Dr. Finklestein that was impressed me. Bravo, Mother! "Behemoth", "Jack Skellington", "Sally", "Dr. Finklestein" from "Nightmare Before Christmas". Here is a noble Pocahontas. I like her style that she takes advantage of her beautiful black hair to become the character. I luckily met a MC and a performer near the Country Bear Theater. Their fluffy dressy appearance are so wonderful. "Henry" & "Ernest" from "Country Bear Theater". Nice Nimo-style overalls! Most lovely part is a back fin with her back. I was impressed by her imagination of the design. Good work, mother Suzy & Perla! They are really cute. "Perla", "Cinderella" & "Suzy", "Prince Charming" from "Cinderella". In this year, there are many Rapunzel in TDL as you can imagine, however uranezu.com like a brunet same as Flynn, therefore I highly recommend you her. And I like her choice which barefoot-conscious shoes. At Toontown in TDL, we can meet the three little pigs wear a colorful costume. This pretty party exactly replicate them. And I like cheerful smile! "Practical", "Fiddler", "Fifer" from "Three Little Pigs".